5.0 (based on 6 ratings) Thanks for your rating! Product #22106 | SKU RODLNK-FM | 5.0 (based on 6 ratings) Thanks for your rating! 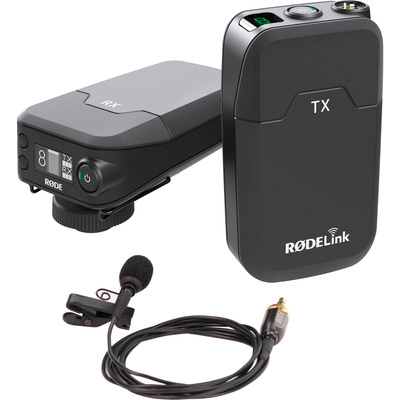 The RodeLink Filmmaker Kit from Rode is a wireless system for film and video production that features a transmitter, receiver, and an included lavalier microphone. The system utilises a Series II 2.4 GHz 128-bit encrypted digital transmission signal that constantly monitors and hops between frequencies to select the strongest signal. The kit offers a high signal-to-noise ratio and provides a high-resolution 24-bit 44.1 kHz digital transmission of lossless audio at a range of up to 100 m Up to 8 systems can be used together simultaneously. The beltpack transmitter features a simple 3-stage gain adjustment and a mute lock function to prevent accidental muting. A locking 3.5mm input audio connector ensures body worn microphones remain secure. The camera mount receiver features a removable shoe mount enabling it to be used on camera or as a belt pack receiver. A mute override function gives complete control to the operator, while mute status, input level, and battery status for both the transmitter and receiver are displayed on the front of the unit. The receiver also utilises the same locking 3.5mm connector as the transmitter to provide solid security. I've been using the RodeLink Wireless Filmmaker Kit for the last 2 months. I'm very happy with the sound quality. So sad that it's housed in a plastic case but at least it's not flimsy plastic. What it looses because of the case is made up for because of the price. It deserves a 5-Star rating.